For Mac users, it will be convenient if you have a good Mac audio recorder that can record and keep the audios you like. Would you like to share your ideas, stories and suggestions about recording audios on Mac? If you have something to say, just leave a message here, and you’ll get Apowersoft Mac Audio Recorder VIP for FREE! Way 1. Anyone who leaves a message here can get a Yearly VIP Account for Apowersoft Mac Audio Recorder. You can share your experience of using any Mac audio recorder, your ideas about Mac audio recording, or any suggestions about Mac audio recorders, etc. All these will impel us to go forward. Way 2. 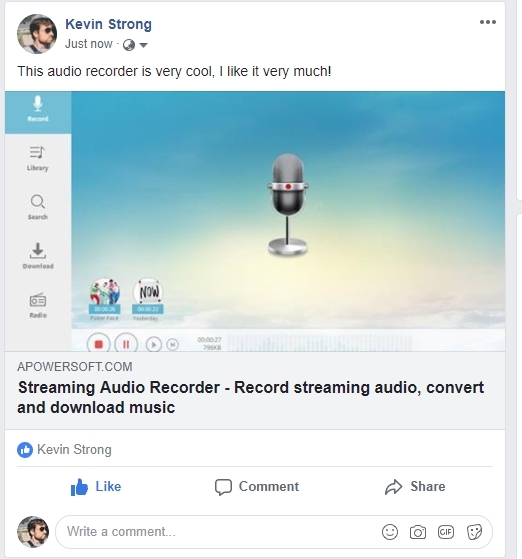 Share Apowersoft Mac Audio Recorder to Facebook and like us, and then you can get a Yearly VIP Account for Mac Audio Recorder. Once done, please send the screenshot to us here or email it to us at support@apowersoft.com. Apowersoft Free Online Audio Recorder is a good tool for me to record audio chats with my friends, and also music that I like. Thank you for making such a good app. Now I want to get the free vip for desktop Apowersoft Audio Recorder on Mac. I have sent the screenshot to your email, just check it. Hi! Thanks for sharing! We have activated your registered email as the VIP account for using Apowersoft Mac Audio Recorder. Please check your email box to check the login information. I was recommended to use this Apower Mac Audio Recorder, and found it light and easy to use. I have already placed an order for yearly license, and I’m here to get another yearly license. Thank you so much for your sharing! Your yearly VIP for Apowersoft Mac Audio Recorder has been activated already, please use your email account to log in and activate it. Thanks for your sharing! Your yearly VIP for Apowersoft Mac Audio Recorder has been activated already, please use your email account to log in and activate it. Thank you very much for your sharing! We have activated your email as the VIP account for using Apowersoft Mac Audio Recorder and sent an activation email to you. Please check it. I was wondering here and there for an audio recorder for my macbook air，because I want to record an awesome song that I heard in an online TV show. I was far impressed about your program?, and I was thrilled to stumble across this free giveaway post. Hope you can offer me a free account so that I can use it to record my favorite songs and even do some audio triming tasks. Thanks. Best wishes for the whole team of apowersoft.? Thank you for your support. Your VIP has been activated already, please use your email account to log in and activate it. Thanks for your sharing. We've already activated your VIP account for Apowersoft Mac Audio Recorder, please use your email account to log in and activate it.